feast at a church supper in Maine. supper by my parents. They weren’t fooling about it being a bean supper either. with crocks of baked beans. Period. It’s taken years for that memory to fade. important role in these suppers. could be baked on Saturday and kept warm in the brick ovens until Sunday. Maine, so we can accept that fact. 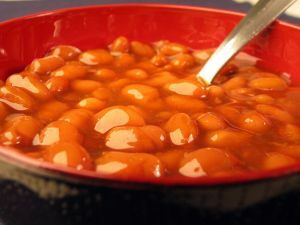 Common to all baked bean recipes are molasses, mustard, salt and pepper. pork, vinegar, curry, rum … as many variations as there are cooks. to attend. A few offer take-out. bean, turkey, roast beef, chicken potpie, homemade rolls with real butter (sigh!). choice of decaf or regular — just coffee. Water’s an option. Church suppers are money makers. Their proceeds often help a needy family. It is only through attrition that one graduates to the coveted kitchen positions. products here! ); another was drying them, a third stirring pots on the stove. Several women were refilling platters, gravy boats and roll baskets. way they’re run. They don’t always run seamlessly though. lanterns, the social hall by candles. The dinner was delicious! Supper, carve time out and go. If you leave hungry it’s your own fault! How do you find where church suppers are being held? How do you know which are the good suppers? over 100 miles to attend one with an outstanding reputation. The paper says the supper starts at 5:00. Isn’t that awfully early? No, cash only. No tipping. No reservations.